Today, we are witnessing a phenomenal surge in E-commerce sites and start-up ventures with some vibrant and offbeat ideas. What is everyone trying to achieve? Is it only commercial success? Guess not, the definition of success for enterprises today is no more confined to monetary gains. The secret spell for long-term success is ‘sustained customer satisfaction’. In a market spending survey by Gartner Research, 89% of the enterprises stated that by 2016 all the business ventures would compete primarily on the basis of customer experience. This means that you need to build robust business processes that enable your Sales and Marketing efforts, which would be possible by implementing the right tools to do the needful. A strong Customer Relationship Management (CRM) tool / platform is today the need of the hour. A CRM platform brings a set of practices, systems, technologies, and strategies that enterprises implement to manage customer communication and customer data through the business lifecycle. The essential objective is to strengthen business relationships and further assist in retention of customers for sustained business growth. As per industry and Analyst reports, Salesforce is currently leading the bandwagon of preferred CRM software vendors. Gartner states that Salesforce leads in terms of revenue in the sales and Customer Service and Support (CSS) segments of CRM, and is now third in terms of revenue in the marketing segment. This competitive gap keeps on widening. Ease of implementation, Scalability, or Agility are cited as some key reasons for Salesforce’s popularity. However, deploying Salesforce and effectively testing it within the business ecosystem is an absolutely critical and strategic move. Salesforce implementation across the organization is defined by its vision and underlying business goals. 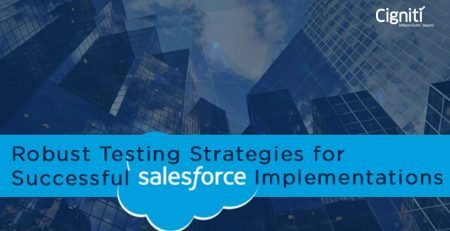 Apart from realizing the testing needs, it is crucial to adopt the right approach towards Salesforce testing. Creating a robust Test framework is indispensable, which is possible by collaborating with an experienced Testing partner. Salesforce applications are getting complex, with shorter development cycles. This triggers the need for a comprehensive test plan, which ensures significant Code coverage and not just target minimum required test coverage. 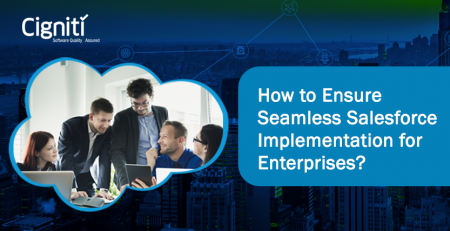 In this article, let’s direct our focus on adopting the best approach for Salesforce Testing, which can ensure business enablement and growth. Primarily, evaluate features as per ease of implementation, ease of adopting them within the business ecosystem and ultimately calculate the training period required. The best way is to bucket your features into categories and then gauge their impact on your business. This can help you straighten up your testing road map and get your system ready. A consistent regression test framework is required for ensuring that the ongoing functions are not affected during the sprints. Executing an automated suite of regression tests improves the ability to deploy these applications rapidly and without compromising on the quality. Moreover, considering an Agile approach enables Continuous testing during the implementation process. With an agile approach you can test various features of Salesforce and align it with the functions to seek buy in from the respective users. Implementing it across the organization and then testing the entire spectrum could be a massive task to cover. However, if you break it into fragments and test in accordance with the respective functions, it will be more productive and effective. Test Automation boosts delivery of applications and facilitates agile sprints with end-to-end testing. This results in cost effectiveness, reduces manual intervention, and mitigates risks with constant integration on Salesforce platform. With increasing number of applications being deployed on Salesforce Cloud, it is important to ensure the functional efficacy of the applications with Performance testing. Performance / stress testing emphasizes on validating the functioning of the applications in a particular environment with the required data. As much as it is important to deploy a CRM, it is equally crucial to train the people who are going to use it. It will help the organization gain more mileage out of the tool and use it effectively on a routine basis. Moreover, this is the right audience who will help you identify the smallest defects and address them at the right time. Salesforce is loaded with features and offers much more than CRM specific functions. With an experienced implementation and testing partner you can build a long-term road map to reap benefits from Salesforce for your organization. The most logical step for long-term benefits and seamless implementation is to on board an experienced Salesforce testing partner. Choosing the right testing partner can help you reap better ROI from your Salesforce applications. An ideal testing partner comes with expertise across domains, testing capabilities, astute team and appropriate advice on the timelines and budgets. It is recommended to on board a partner who will not just execute testing job for you, but will also advise you on the right strategy and build a robust test framework that brings consistency in the testing process. Cigniti experts bring comprehensive experience and expertise in Salesforce Testing. Connect with Cigniti experts to gain from the extensive experience of its Salesforce Test Architects and witness business transformation for sustained growth.